The Prime Minister (Swedish : statsminister, literally "Minister of the State") is the head of government in Sweden. Before the creation of the office of a Prime Minister in 1876, Sweden did not have a head of government separate from its head of state, namely the King, in whom the executive authority was vested. Louis Gerhard De Geer, the architect behind the new bicameral Riksdag of 1866 that replaced the centuries-old Riksdag of the Estates, became the first officeholder in 1876. Kjell Stefan Löfven is a Swedish politician serving as Prime Minister of Sweden since 2014, and Leader of the Social Democratic Party since 2012. The Swedish Social Democratic Party, contesting elections as the Arbetarepartiet–Socialdemokraterna and usually referred to just as the Social Democrats (Socialdemokraterna), is the oldest and largest political party in Sweden. The current party leader since 2012 is Stefan Löfven, who has also been Prime Minister of Sweden since 2014. The Monarchy of Sweden concerns the monarchical head of state of Sweden, which is a constitutional and hereditary monarchy with a parliamentary system. The Kingdom of Sweden has been a monarchy since time immemorial. 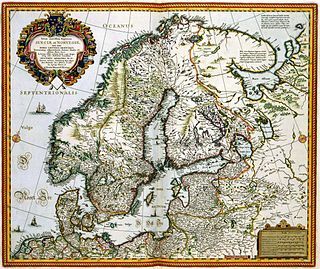 Originally an elective monarchy, it became an hereditary monarchy in the 16th century during the reign of Gustav Vasa, though virtually all monarchs before that belonged to a limited and small number of families which are considered to be the royal dynasties of Sweden. The Council of the Realm, or simply The Council, was a cabinet of medieval origin, consisting of magnates which advised, and at times co-ruled with, the King of Sweden. At the adoption of the new Instrument of Government of 1809, the two offices of Prime Minister for Justice (Swedish : Justitiestatsminister) and Prime Minister for Foreign Affairs (Swedish : Utrikesstatsminister) were created, though their roles were no more than just the heads of their respective ministries. When the office of the Prime Minister was created in 1876, the Prime Ministers for Justice and Foreign Affairs were thus subsequently demoted to Minister for Justice and Minister for Foreign Affairs. Unlike the Minister for Justice, the Minister for Foreign Affairs did however continue to be styled as "Excellency", an honour shared only with the Prime Minister. From 1917, parliamentarian principles were definitively established in Sweden and the Monarch ceased to exercise their constitutional authority to appoint the Prime Minister and the Councillors of State (cabinet ministers) at their own discretion. From that time onward, the Prime Minister depended on the support of a majority in the Riksdag. Over time, the Prime Minister came to de facto exercise the Royal prerogatives. However, the Swedish term used for the Government during this period, still was Kungl. Maj:t, an abbreviation of Kunglig Majestät (English: Royal Majesty). The Instrument of Government adopted on 6 June 1809 by the Riksdag of the Estates and King Charles XIII was one of the fundamental laws that made up the constitution of Sweden from 1809 to the end of 1974. The Minister for Justice is the justice minister of Sweden and head of the Ministry of Justice. The current Minister for Justice is Morgan Johansson of the Social Democratic Party. The Minister for Foreign Affairs is the foreign minister of Sweden and the head of the Ministry for Foreign Affairs. King in Council, or Royal Majesty, was a term of constitutional importance that was used in Sweden before 1975 when the 1974 Instrument of Government came into force. Gösta Ingvar Carlsson is a Swedish politician who twice served as Prime Minister of Sweden, first from 1986 to 1991 and again from 1994 to 1996. He was leader of the Swedish Social Democratic Party from 1986 to 1996. He is best known for leading Sweden into the European Union. Nils Daniel Carl Bildt is a Swedish politician and diplomat who was Prime Minister of Sweden from 1991 to 1994. He was the leader of the Moderate Party from 1986 to 1999. Bildt served as Sweden's Minister for Foreign Affairs from October 2006 to October 2014. Hans Göran Persson served as Prime Minister of Sweden from 1996 to 2006 and was leader of the Swedish Social Democratic Party from 1996 to 2007. With the exception of the Prime Minister, cabinet ministers (Swedish : statsråd) do not need the approval of the Riksdag, but they can be forced to resign by a vote of no confidence. If the Prime Minister is forced by a vote of no confidence to resign, the entire cabinet falls, and the process of electing a new Prime minister starts. The Prime Minister can dissolve the Riksdag, even after receiving a vote of no confidence, except during the first three months after an election. Politics of Sweden takes place in a framework of a parliamentary representative democratic constitutional monarchy. Executive power is exercised by the government, led by the Prime Minister of Sweden. Legislative power is vested in both the government and parliament, elected within a multi-party system. The Judiciary is independent, appointed by the government and employed until retirement. Sweden is a monarchy. The Riksdag is the national legislature and the supreme decision-making body of Sweden. Since 1971, the Riksdag has been a unicameral legislature with 349 members, elected proportionally and serving, from 1994 onwards, on fixed four-year terms. Baron Louis Gerard De Geer of Finspång was a Swedish statesman and writer. He was born at Finspång Castle in Risinge parish. He was a lawyer, and in 1855 became president of the Göta hovrätt, or lord justice for the appellate court of Götaland. From 7 April 1858 to 3 June 1870 he was Prime Minister for Justice and again from 11 May 1875 to 20 March 1876. As a member of the nobility, he took part in the Swedish Riksdag of the Estates from 1851 onwards. From 1867 to 1878 he was the member for Stockholm in the first chamber in the New Riksdag, where he introduced and passed many useful reforms. Rosenbad is a building in central Stockholm, precinct of Norrmalm. It is a building owned by the Swedish State and serves as the seat of the Government. The speaker of the Riksdag is the presiding officer of the national unicameral legislature in Sweden. The Swedish constitution allows the Prime Minister to appoint one of the Ministers in the cabinet as Deputy Prime Minister, in case the Prime Minister for some reason is prevented from performing his or her duties. If a Deputy Prime Minister has not been appointed, the Minister in the cabinet who has served the longest time takes over as head of government. Anders Ingvar Ygeman is a Swedish politician of the Social Democrats. He served as Minister for Home Affairs in the Swedish Government from 2014 to 2017. He has been a member of the Riksdag since 1996. Per Olof Andreas Norlén is a Swedish Moderate Party politician who has served as Speaker of the Riksdag since September 2018. He has been a Member of the Riksdag (MP) for Östergötland County since October 2006. Norlén has previously been a member of the Committee on the Constitution, 2014–2018 as chair of the committee. Lars Mikael Damberg is a Swedish politician of the Social Democrats. He has been Minister for Home Affairs since 21 January 2019. He has been Member of the Riksdag since 2002, representing Stockholm County, and was leader of the Social Democrats in the Riksdag from 2012 to 2014. The Government of the Kingdom of Sweden is the national cabinet and the supreme executive authority of Sweden. The short-form name Regeringen is used both in the Fundamental Laws of the Realm and in the vernacular, while the long-form is only used in international treaties. The first cabinet of Stefan Löfven was the cabinet of Sweden between 2014 and 2018. It was a coalition government, consisting of two parties: the Social Democrats and the Green Party. The cabinet was installed on 3 October 2014, following the 2014 general election. It lost a vote of no confidence following the 2018 election, but remained in office as a caretaker government. Anna Frida Wiktoria Johansson is a Swedish politician of the Social Democrats. She was the Minister for Infrastructure in the Swedish Government from 2014 to 2017. 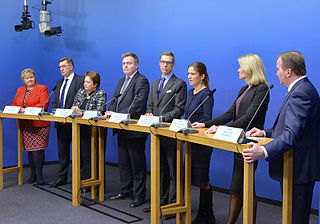 The 2014 Swedish government crisis started on 3 December 2014 after the Riksdag rejected the proposed government budget in favour of a budget proposed by the centre-right opposition. 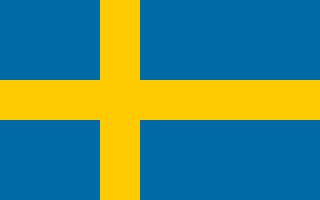 General elections will be held in Sweden on 11 September 2022 to elect the 349 members of the Riksdag. They in turn will elect the Prime Minister of Sweden. regional and municipal elections will also be held on the same day. In the 2018 Swedish general election, no political group or party won an outright majority, resulting in a hung parliament. On 9 September, the Red-Greens, led by Stefan Löfven's Social Democrats (S), emerged as the main political force in the Riksdag, while the centre-right Alliance led by Ulf Kristersson's Moderate Party only got one seat less. The right-wing populist party Sweden Democrats, led by Jimmie Åkesson, came third. As a result, protracted negotiations were required before a new government could be formed. On 18 January 2019, Löfven was re-elected as prime minister. 1 2 "Statsrådsarvoden och ersättningar (Swedish)". Regeringen.se. ↑ "Forming a government". Sveriges Riksdag. 2016-12-06. Retrieved 2018-03-24.